Today I have brushed up some of the major Traffic rules to be followed to check accidents. I know even after so much mess and loads of traffic, it is only the Indian people who can carry on with this without accidents. Still I am sharing some traffic rules to be followed by drivers and pedestrian. Always be on the left side of the road. This is very basic rule but still many don't follow. NEVER DRINK AND DRIVE!! REMEMBER AFTER WHISKEY DRIVING RISKY. Don't use mobile or carefully listen to radio or music player in heavy traffics. You may face accident. Remember to follow the traffic light or the traffic police. Red to stop, Yellow/Orange to Get ready and Green to go. If you have to wait more than 15 seconds then turn off the vehicle to save the precious fuel. Stop your vehicle if there is just less than 5 seconds time on the traffic light. Never try to speed up and cross in this limited time. Also stop at least 5 m before the line or zebra cross. Never cross the speed limit. Speed limits are always mentioned on the side boards. If the speed limit is not mentioned then limit between 40 - 45 kmph. Never try to overtake. If the vehicle ahead of you stops, blow horn but never try to slip from sides by changing lanes. This way you may hurt someone. If you are overtaken by other, stay calm but don't speed up or slow down your vehicle. Don't Park your Vehicle on the road just to save pennies for parking spot. The traffic police may double charge you for that.When parking the vehicle make sure that it does not cause any danger, obstruction or inconvenience for other road users. Always give away the Ambulance, Police Vehicle or other Emergency vehicles to pass before you. Never Cross the yellow or white line symbolizing the limits of the road. Keep your vehicle limited to the road. These documents are to be produced on demand by any Police officer in Uniform, Officers of the Motor Vehicles Department in Uniform or by any officer authorized by the Government. If the driver does not have the documents in his/her possession he should produce attested copies in person or through registered post to the officer who demanded it within 15 days. You should not carry any suspicious material like gun or explosives or naked fuel. Maintain proper distance between your vehicle and ahead vehicle so that there is no clash during sudden stops. Always wear seat-belts and encourage others sitting in your vehicle. If you are on bike don't forget to wear a helmet. Use indicators before taking turns. If your indicator is faulty get it repaired soon. One the roads marked as "One-way" never try to drive in inverse direction. 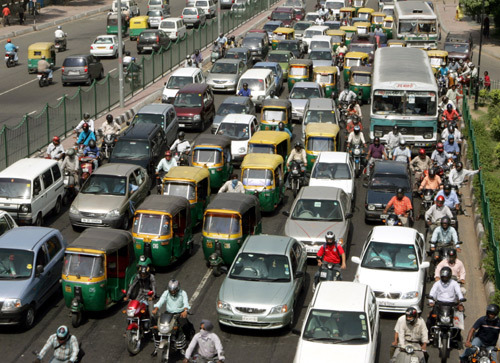 Rickshaws and Auto-Rickshaws should run their vehicles as left side as possible as they need to stop frequently. Bikes must not be overloaded with 4 or more persons. There are good chances of meeting an accident. Don't Litter up the roads. Remember it is one way your own property. Be patient. Never get on a Road Rage. Always be on the left side of the road. Use Foot Path if available. Pay attention while walking. Don't disturb others by not listening to horns blowing. Never try to cross the road by waving hands and stopping vehicles. Some vehicles may not stop putting you in Danger. Always try to use Zebra Crossing to cross the road. If you can't find a Zebra Crossing, Cross the road when it is completely clear. Don't use mobile phones or camera while walking or crossing the road. CBSE vs ICSE - Which is better ?? Sushant Gupta. Picture Window theme. Powered by Blogger.